Looking for a fun weekend project? Or maybe you have a freight car that needs a little something extra and you just want some inspiration and guidance. Maybe one of these projects will get you going. Each project has step by step instructions to complete the model as seen with links to specific techniques as necessary. So if you want to reproduce the model, or just duplicate the effects, you'll have all the information you need. The finished model still retains the heritage of the original CB&Q car, but now reflects its age in more ways than one. ©2011 Ryan C Kunkle, licensed to About.com, Inc. Here's a fun freelanced weathering project that can breathe some new life into an old car. You don't have to spend a lot to create a beautiful model character. Compare the before and after photos to see just how much a little paint and weathering can do to a simple car. ©2012 Ryan C Kunkle, licensed to About.com, Inc.
A distinctive load gives a fast and inexpensive makeover to a basic car. The finished model looks almost nothing like the original. The best feature is the pride you get from a job well done. ©2014 Ryan C Kunkle, licensed to About.com, Inc. This project shows that with a few detail parts and a little work, even the most inexpensive toy train cars can be turned into a scale model which will rival any of the current offerings. This car takes it to the extreme - stripping down cast on details and paint, adding new parts, paint, decals, weathering, even a new load. 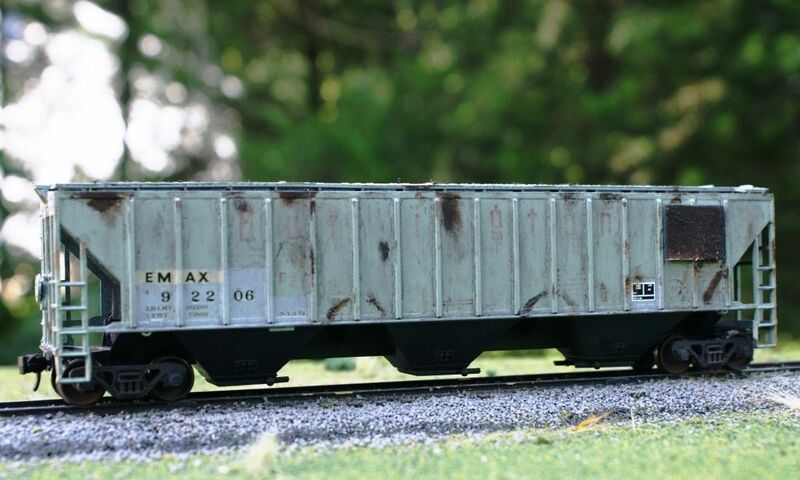 The addition of wire grab irons and brake lines helps complete the look of Walthers' HO scale Depressed Center Flatcar. ©2010 Ryan C Kunkle, licensed to About.com, Inc.
Add some simple details to dress-up a Walthers depressed center flatcar.